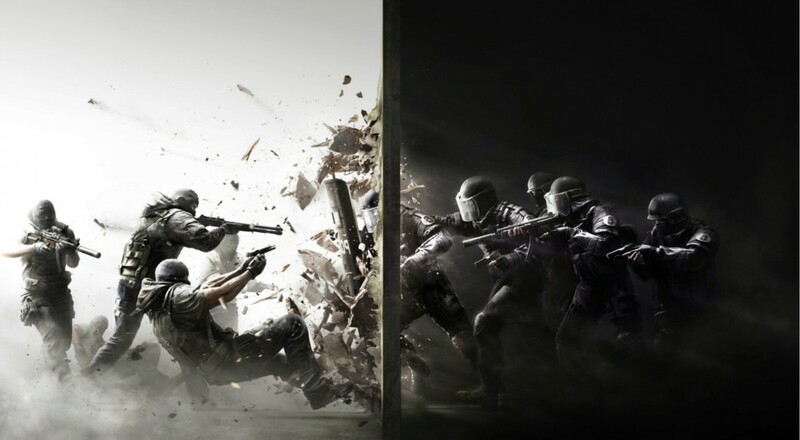 Rainbow Six has been synonymous with co-op since its inception. A game designed around close quarters tactical combat, players are put in the shoes of a team (or teams) or Rainbow Six members to fight terrorism around the world. Over the years the series has evolved from its roots on the PC which featured a more strategic approach, while the later games set in Las Vegas focused more on action. In all of these games the common thread was teamwork to take down terrorists. The reward was in the execution. Rainbow Six: Siege isn't your typical Rainbow Six game though. It's the first in the series that is a multiplayer only title, and really, it's a title focused on competitive play. There's no story here and whatever there was from the now cancelled Rainbow Six Patriots isn't seen; instead I believe we're seeing the technology from that game on display. 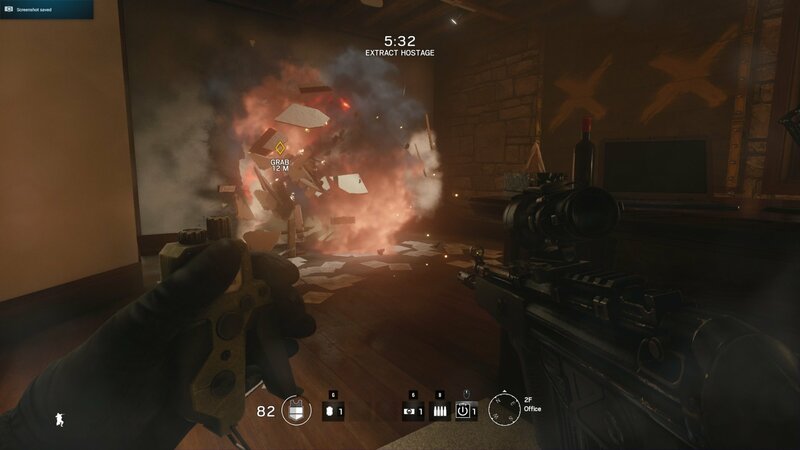 Siege's unique feature is the fully destructible surfaces, making almost no piece of cover a safe place to hide. In multiplayer this makes the matches that much more unpredictable, in co-op it means the terrorists are always in the line of fire. Rainbow Six has always had a focus on the characters, though in most cases this was through the story. In Siege the characters are actual Operatives the player can choose. It's like deciding which character to play as in a fighting game. Each Operative serves different roles and can use different weapons, gadgets and abilities. 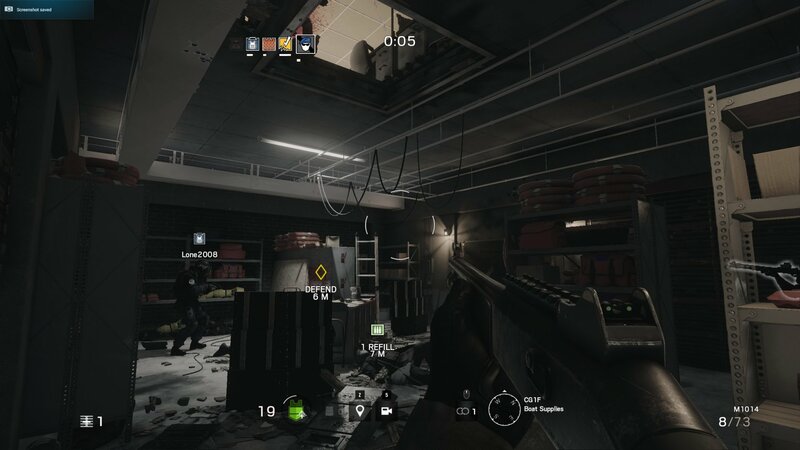 For example there are operatives who can carry devices which detect electronic traps, while another operative carries the device that actually disables them. Some operatives are more defensively focused and can set up barricades, barbed wire, or trip mines. Others are more offensively focus bringing mounted machine guns, flash bangs, and remote detonation devices to the mix. In all cases choosing the right set of complementary Operatives increases your chances of success. The Operatives themselves are unlocked as you play the game and earn experience. Experience is earned in all game modes: "single player," co-op and competitive. I put single player in quotes because once again I want to state - there is no story mode in Siege. Instead players are given ten situations they can complete on three difficulty levels with three optional objectives in each one. I will say this - these scenarios are incredibly satisfying and also super challenging. But the lack of a campaign is definitely missed. Outside of these scenarios we have the five player co-op terrorist hunt mode which can be played online in a party or with randoms. The mode isn't just an all out “Kill 25 Terrorist” type thing. Instead there are different modes available. For example there might be a bomb defusal objective or a hostage rescue objective thrown into the mix on top of the actual hunting of terrorists. Players are given remote camera RC vehicle to scope out the building(s) to assault and plan their attack - this takes the place of any normal overhead style planning phase. Before a scenario starts players build a team of Operatives based on what the mission objective and map is, and then vote on an insertion point. It's here there's some level of strategy needed to ensure your team has all of the roles required to successfully complete an objective. Bringing someone that can disable electronics for instance is wise during a bomb defusal or hostage mission, while making sure you have someone with the bigger guns during a straight hunt is also the smart choice. With a good array of maps, objectives, and difficulties the Terrorist Hunt mode is incredibly replayable, just like it always has been in previous Rainbow Six games. This mode was always where you ended up with friends after completing the campaign, so it's nice this wasn't omitted. 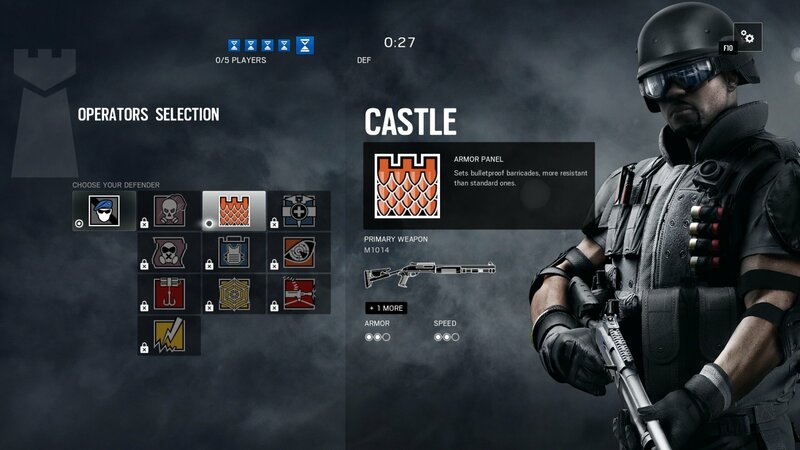 The competitive mode is the reason to buy Rainbow: Six Siege as it's here you'll have the most replayable game play. Because of the unpredictable and destructive nature of the environments, the five vs five rounds tend to escalate and end rather quickly. Teams take turns attacking and defending bombs and hostages. Once again there's a planning phase for attackers while the defenders board up doorways, windows, and set traps for the impending assault. Teamwork is absolutely critical in this mode to be successful, and you absolutely have to communicate. It's because of this the competitive mode is as equally frustrating as it is rewarding depending on the matchmaking. I can't help but feel like Rainbow Six: Siege has all this great but wasted potential. While the smaller and quicker replayable scenarios and terrorist hunt missions scratch an itch, it simply doesn't fill the void left by a proper story and true co-op campaign. The competitive mode is fun but feels disingenuous to Rainbow Six's heritage. Terrorist Hunt is a bit deeper and more cooperative than past iterations thanks to Operatives. I still yearn for the day we get a true sequel to the first game where there's a proper planning phase that players draw up on blueprints together and then an execution of that plan. While Rainbow Six: Siege is solid and satisfying in some ways, it's simply doesn't feel like a title worth the full price of admission. Page created in 0.3770 seconds.